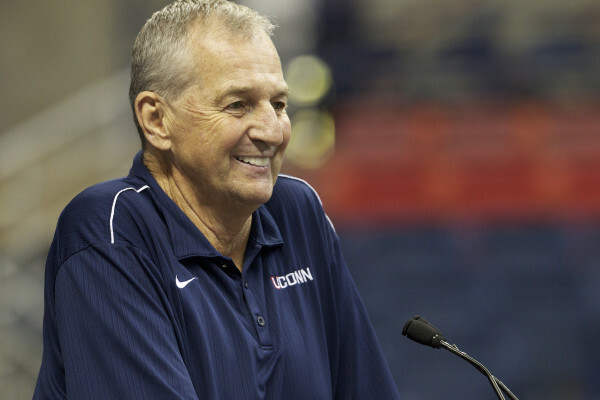 Jim Calhoun is the former head coach at UConn and a Basketball Hall of Fame inductee. His coaching career is filled with accolades: 23 NCAA Tournament appearances, seven Big East championships, four Final Four appearances and three National Championships. With the Final Four a few days away, we had an opportunity to chat with Calhoun and discuss the upcoming weekend, his thoughts on what it takes to be successful in the NCAA Tournament, and his most memorable experiences as a head coach. Rush the Court: With regard to preparing for the NCAA Tournament, what do you think was the most common element of your most successful teams? Jim Calhoun: The thing we try to do, the most important element, is having good players and hopefully some experienced players that have been there before. Because stepping on that big stage — whether it be Madison Square Garden or NRG in front of 79,000 people — is a big deal. But as the season wound down we made sure we cut down on practice. As we got closer to the Tournament and found out the bracket, we tried to prepare for each team. For example with a team that would throw a press on, we would work on that even though we may not be playing them first, but maybe the next game. Rush the Court: During the regular season, did you find yourself preparing by mixing and matching different defenses and offensive schemes as you got closer to the Tournament? Jim Calhoun: Yeah we did. As we got closer to tournament play, for example in the Big East with a bye where we might play one or two teams, we really scouted both teams. So in the first 20 minutes of practice, we might work against a 1-3-1; we might work against some pressure. I never wanted the kids to face something they hadn’t seen before. Rush the Court: Do you still talk to Kevin Ollie? Does he ask you for advice? Jim Calhoun: Yeah, we talk a lot. I don’t want to be at practice with media or other people only because this is Kevin’s focus. He’s done a wonderful job running it, he won a National Championship, he’s done a terrific job in the AAC this year and in the tournament. I want people to know who the head coach is. Conversely, I’m there for Kevin, we talk about the game, about life and about being a coach. Rush the Court: Do you have any advice for Jay Wright or Lon Kruger, neither of whom yet has an NCAA championship under his belt? Jim Calhoun: Make sure you celebrate and enjoy it. Because really, you don’t know when it’s going to happen again. And secondly, beyond that, slowly but surely get your kids ready to focus. Get rid of all the distractions. Rush the Court: Looking back on your career, what was the single proudest moment you experienced? Jim Calhoun: My second year, we won the NIT with 18,000 at Madison Square Garden and we beat a really good Ohio State team. That showed people in our hometown and recruits that we could win something that people never thought we could, and that was only year two. We had just gone through five straight losing seasons so it was a big deal, and that moment kind of helped turn the corner. Two years later we lost to Christian Laettner in the Elite Eight and after that we had a pretty good run. Rush the Court: You were hired during the early years of the Big East. What are your thoughts on the Big East now and what it has become? Jim Calhoun: The Big East is terrific. There’s really good teams, really good coaching. Of the nine guys, we had nine when I started, six of us are in the Hall of Fame. We miss the great Big East, but you can’t always compare something to the greatest ever. And that certainly was the greatest conference in the history of basketball. Rush the Court: Do you have any Final Four predictions? Jim Calhoun: I think that Villanova will beat Oklahoma in a very tight game, up and down, and I do think that North Carolina will beat Syracuse. Then in the finals, I’m going to give the slight edge to Carolina because I think they have pedigree. This entry was posted on Thursday, March 31st, 2016 at 9:01 am by Justin Kundrat	and is filed under 2016 ncaa tournament, feature, rtc interviews. Tagged: connecticut, jim calhoun, rtc interviews. You can follow any responses to this entry through the RSS 2.0 feed. You can leave a response, or trackback from your own site.